Are you also looking for an effective computer glasses that can protect your eyes while playing in front of digital devices? Do you want to consider all your options with regard to this eyewear? Well, I suggest that you read this article in order to learn more about the best computer gaming glasses of 2018. Gaming is a continually improving recreational activity most especially in today’s world. There are already plenty of devices that you can use such as computer, laptop, xbox, tablet and even mobile phones. All of these devices can bring fun but anything that is too much can bring something unpleasant. Since almost all of us are always in front of digital screens, we are all prone to computer vision syndrome. Basically, we are exposed to the harmful blue light that usually causes some vision problems and other related issues. With this problem, there are already plenty of things that you can use to prevent these from happening. And computer gaming glasses is one of them. This kind of eyewear is specially designed to help the user to have a better gaming experience and prevent eye strain from ruining our eyes. 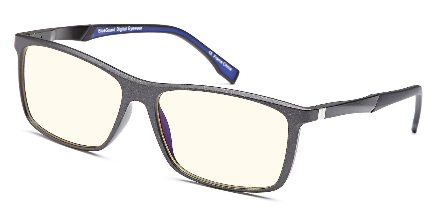 So I decided to make a list of the best computer gaming glasses that you can take advantage. This is based on the quality, durability and effectiveness of the lenses. I hope that this can help you choose the one that suits your preference. The glasses is framed with a sporty design. It almost have the same look as ordinary glasses but this frame contains more elegant yet smooth curves. 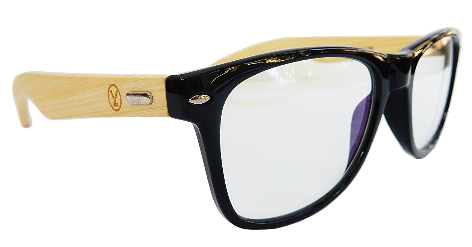 The eyewear has a wayfarer design – one of the most trendy designs a user could wear these days. It is designed like sunglasses so it fits most face shapes and sizes of various people. The full-rimed frame is mostly made from Aviation grade carbon fiber which is also known as ‘black gold’ in the industry. The carbon fiber gives a 10 time better sturdiness and flexibility to the frame which any metal would have provided. What I like the most about this eyewear is its frames. It is made from a high-quality material which makes them lightweight and strong. Actually, you can wear them for a long time without feeling any extra weight on the face. The glasses come with a highly attractive and stylish frame structure. These black-brown full-rimmed frames fit almost all head sizes. There are also fixed nose pads at the ends of the 18-millimeter wide frame bridges make sure you feel comfortable while using the lenses. If you work in front of digital screen and suffer from problems like red dry eyes with mild headache then these Gezan BL010 Computers glasses is an immediate solution. The frame of these glasses is wide and nice. Actually, they fit over your regular or prescribed glasses elegantly and work seamlessly from the top. The frame is made from Acetate material which is slightly different from other regular frame materials like plastic or any typical alloy. The Acetate in the frame enables them to be extremely flexible and smooth. The frames are designed to minimize the pressure on the face. There are total seven of colors to choose from. Basically, it is made from an injection polymer material which provides its sturdy looks and light weight design. Gunnar Optiks INT-06401 Intercept Computer glasses are well known for their absolute protection against all the high energy radiations that can harm our eyes. The frame of these Gunnar glasses is designed to fit all head sizes. Actually, what I like about this eyewear is the heat/carbon color of the frames. Aside from it is comfortable to wear, it is also fashionable. What I like about Trust Optics FeatherView is its sturdy frame structure. It ensures that the glasses will last for a long period of time. The frames of these Gunnars are adjustable so you don’t have to worry if your head is big or small. The flexible frame will fit any head size. The temple is rounded which gives them a better fit over your head. 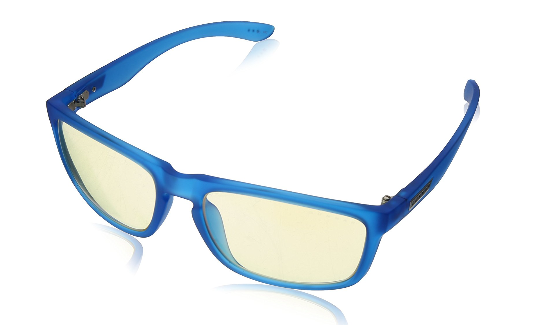 Gunnar Optiks VAY-00101 Vayper computer glasses claim to protect the eyes from intense blue light and ultra violet component that can cause extensive damage to the eyes. What I like about this eyewear is that the frame is a perfect fit for all head sizes. The spring powered temples of the glasses also provide a firm grip over the head area. The lens is designed with the amber tint and other coatings that prevent high-energy and Ultra Violet glares from reaching the eyes. 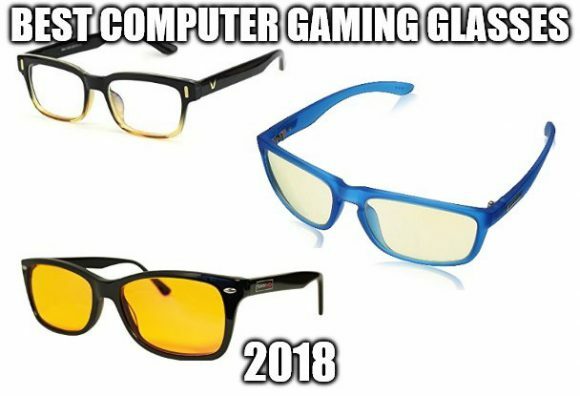 These are just some of the best computer gaming glasses that you can have for this year 2018. Among these eyewear, I personally prefer the gamma ray and the swanwick glasses. The design is simple and looks like typical glasses. For those people who wants to try tested and proven brands, you can look into gunnar glasses. Although it is more expensive compared to your other choices. Nevertheless, all of these glasses provide a top notch protection for our eyes against the harmful blue light. So it just depends on your own personal preference. Hey John. It’s interesting that I stumbled across this review because I got a new phone and one of the settings said something about reducing blue light. I found it cool but don’t really understand how the blue light affects our eyes. Do you have anymore info about it on your site? I’m also wondering if one tint color is better or more benefitial than another, color or clear? Blue light contributes to some eye problems such as eye strain, red eyes and dry eyes. This is definitely a problem if you spend most of your time in front of digital devices. As for the tint color, all of them blocks the blue light. The tint color only matters depending on your needs. 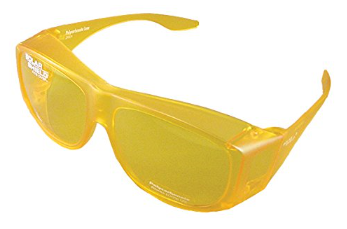 For example if you want to see the true color of your screen then I suggest that you use the clear tinted computer glasses. 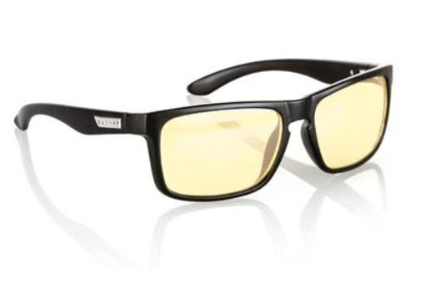 Hi John, I spend a lot of time on my computer doing work and playing games and that’s why I was looking for computer glasses to reduce the strain on my eyes. I will definitely take a look and consider your recommendations before purchasing and may I ask also if you have those that have prescription included? Thanks for this list and looking forward to your reply! Yes, there are computer glasses that include magnification on its lenses. But, for this list I haven’t included an eyewear with magnification. You are completely right. The amount of time we spend our time is huge. We at least spend around 4 to 5 hours per day. That is around 365 x 5 that equals to 1845 hour per year. This is not including marathon gamer who spends + 10 hours straight daily. This can a cause a serious damage to the eyes. Fortunately the gaming community is huge and everyone is being conscious about their overall health. That is the reason this product exist in the first place. I agree with you. Actually aside from working 8 hours a day on weekdays in front of the computer, I also play computer games, 8 hours a day during the weekends. So having computer glasses can be a great help to reduce or even prevent your eye issues. I liked your site on ergonomics, it is so true that we need to look after our eyes and your information on the different glasses was quite interesting as I never knew there was so many to choose from. also i did not know about vitamins for your eyes. Overall your site is very good and keep up the good work.